Over the last several thousand years acupuncture needles have evolved fabulously from an odd thorn or a thin peace of bone, often resembling a long, hand-sharpened stick, to a very fine and elegant instrument, as thin as human hair (the needle diameter varies from 1 mm to 3 mm). 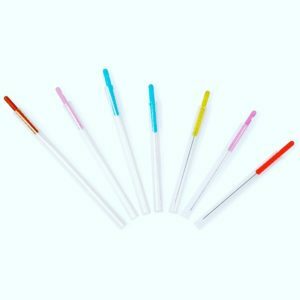 Comparing an acupuncture needle to a needle used for injections is like comparing a pencil to a flute, with acupuncture needles being super thin and solid, while the medical ones – hollow and much thicker, like tiny pipes, to allow a free passage of fluids through them. All modern acupuncture needles are single use (so no risk of infection), machine-sharpened to microscopic perfection (so no pain on insertion), extremely flexible and virtually unbreakable. In 1978 Seirin, a Japanese company from Kyoto, introduced the world’s first disposable acupuncture needle, totally transforming how acupuncture treatments felt for millions of people worldwide ever since. Having a good acupuncture treatment today is an experience like no other, so you can tap comfortably into your better health flow with acupuncture!